The Pope’s canonisation of the 800 martyrs of Otranto throws a spotlight onto one of the most dramatic incidents associated with the Ottoman conquests during the Renaissance. The 800 victims were all men, and nearly all were anonymous – the only one whose name we know was their leader, a tailor called Antonio Pezzulla. They are entering the Catholic Church’s pantheon of sanctity because they bore witness to their faith in extraordinary circumstances on 14 August 1480. A Turkish army had just captured the port of Otranto and they were herded to a hill where, offered the choice between conversion and death, they chose death. They were beatified, which is the first step towards canonisation, as long ago as 1771 following a process that had begun in 1539. It all exemplifies how slowly the Church can move: but then it looks towards eternity rather than the next election. This is not the new Pope’s initiative: his predecessor announced it in consistory on 11 February 2013 – the same consistory at which he released news of his intention to resign from his office. Occurring at the same time as that bombshell, it’s hardly surprising that the announcement about ‘the Otranto 800’ went unnoticed, at any rate by most people. The canonisation, on the other hand, has been something of a news event, attracting major coverage in The Guardian which carried a photograph of the thousands of people who gathered in St Peter’s Square for the occasion. What should we read into this event? A mass canonisation of this kind is certainly unusual. If this were the world of politics we might even be tempted to say that Pope Benedict stitched up his successor, rather like Bill Clinton spending his last hours as president signing bills of pardon. 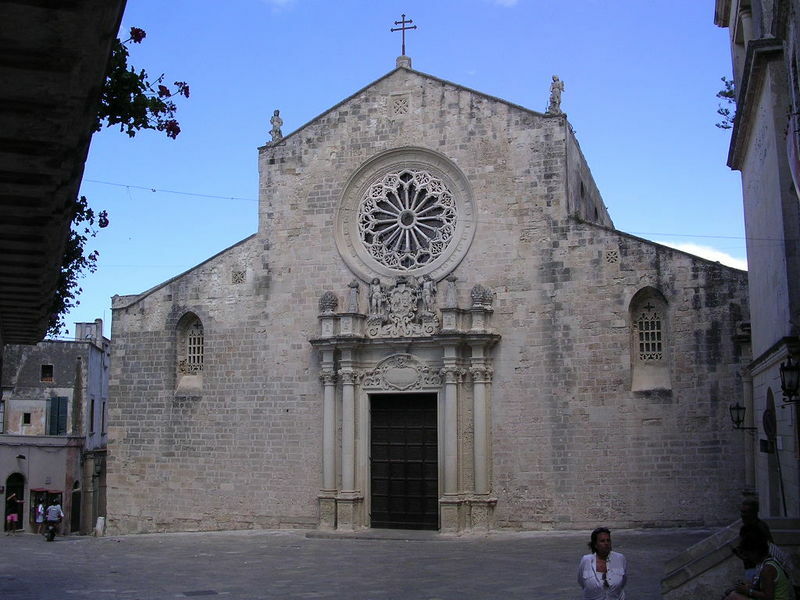 But the timing is more likely to be coincidental: there has been an extended lobbying process by the archbishop of Otranto and the city’s region, where the 800 have been regarded for generations as patrons and protectors. This is far from signalling a new attitude of antagonism towards Islam, on the part of either Benedict or Francis. Benedict did declare in 2007 that the perpetrators killed their victims because of odium fidei (‘hatred for the faith’), but the Church is not going to accuse Muslims today of queuing up to imitate what the Turkish commander did in 1480. Hard-line anti-Islamists – and there is no shortage of them online – who have been excited by the prospect of having these new saints on the books are therefore misguided. The same applies to any Muslims tempted to construe the canonisation as an anti-Islamic gesture. The key to the Church’s thinking resides in the papal comment, quoted above, about showing courage in the face of violent oppression. It’s not the source of the oppression, but the response of its victims, that lies behind this remarkable canonisation. None the less, the long-delayed canonisation is very interesting in terms of what actually happened back in 1480.There had been Turkish massacres before – it was an accusation that was constantly made during the Ottoman advance westwards into Christian territory. Constantinople in 1453, Venetian Negroponte (in Greece) in 1470, were other leading examples. What marked out Otranto as different was its location. This was Italy’s 9/11 moment. The Turks were at the gates, just as commentators had been warning – to no effect – for decades. Rome itself was threatened, and Pope Sixtus IV considered evacuating the city. There was panic, and a crusade was hastily summoned. The deaths of the 800 were real, not invented, but they were mightily convenient for the purposes of the Pope and the king of Naples. When Otranto fell, the two men were at loggerheads but, thanks to the Turks, they became partners in the joint venture of ridding Italy of these barbarians from the east. In the event this didn’t prove difficult, thanks to the death of the great sultan Mehmed II in May 1481, which threw Ottoman plans for Italian conquests into disarray. Renaissance politics were volatile, and changes of allegiance among the states of Italy were especially rapid. In such a world the response to Mehmed’s capture of Otranto offered a modicum of hope and inspiration: a surge of alarm and unity for the cause of saving the faith, the same faith to which the 800 Martyrs bore witness through their heroic sacrifice on the Colle di Minerva. But the surge proved to be short-lived. Fourteen years later the same cry of ‘out with the barbarians’ (‘fuori i barbari’) was raised, its target not Ottoman janissaries but the French troops led by Charles VIII. Conflict between the Christian states became more intense and plummeted to new depths of savagery. Many more people died violent deaths during the sack of Rome in 1527 than at Otranto in 1480, their killers not Muslims but fellow Christians.